This is Takom’s 1:35 M3 Grant tank. The build was straightforward enough although it did require a little fettling on a couple of panels. Whilst at Scale Model World 2018 I visited the Resicast stand and picked up their resin stowage for this kit. As a bonus they included a replacement main gun with a protective canvas cover so often used by British Grants in the North African desert. The fit of the barrel was pretty good, with just a little piece of plastic strip being used to fill a small gap above the canvas cover. The figure is from Ultracast and is full of character just needing some twisted lead wire for the microphone and headset. The base is from Just-Bases with ground work made from indoor Polyfiller and painted with acrylics. This was then covered with “Battle Zone Desert Scatter” from Javis “Countryside” Scenics secured with PVA Glue with tufts of grass from the same company. A dusting of Pinnacle Desert Sand weathering pigment tied it all together. The sign is made from strips of Balsa painted black with 4mm Letraset dry transfer lettering and is an example of Allied Gallows Humour. Construction was a time-consuming endeavour as the base kit, tracks and all additional accessories added up to a monster parts count. The Meng kit is a gem and goes together “Tamiya” like. The DEP additions were astounding in their detail, and engineered beautifully, though a steady hand and magnification was needed to solder the fuel barrel mounting rack together. The final challenge during the construction phase was forming the turret basket covers. This was done with aluminium foil. Painting consisted of a Mr.Surfacer 1500 grey primer coat. The base colour was a mixture of several IDF sand grey tones, both lighter and darker to achieve a modulated finish. Over this I sprayed 2 light coats of hairspray for later chipping duties. The sand colour top coat (Tamiya Desert Yellow XF-59) was sprayed all over the model in several very light coats, then chipped, more hairspray, more top colour, more chipping….and so on. Several light pigment coats of various shades to match XF59 were added to the upper surfaces of the model, primarily over the anti-slip coating, this was sealed with an enamel pigment fixer. All of the smaller details such as the turret mounted machine guns, tow cables, trophy sensors etc. were painted in the same manner as the main hull and turret. Final detail painting was done primarily with AMMO’s Oilbrushers, fuel and grease stains, along with additional sand tones. Here is my latest model made from the Tamiya 1:35 scale kit; hope you all like it! Miki S.
Here’s my M3A1 Stuart in 1:35 scale from the Academy kit with Formations conversion, AFV club suspension and tracks. Eduard PE and RB model barrel. This project was a commission build for someone who has a real Stuart tank (as you do, G!). Most of the features of the real tank can be seen in this model. Like the name and numbers. 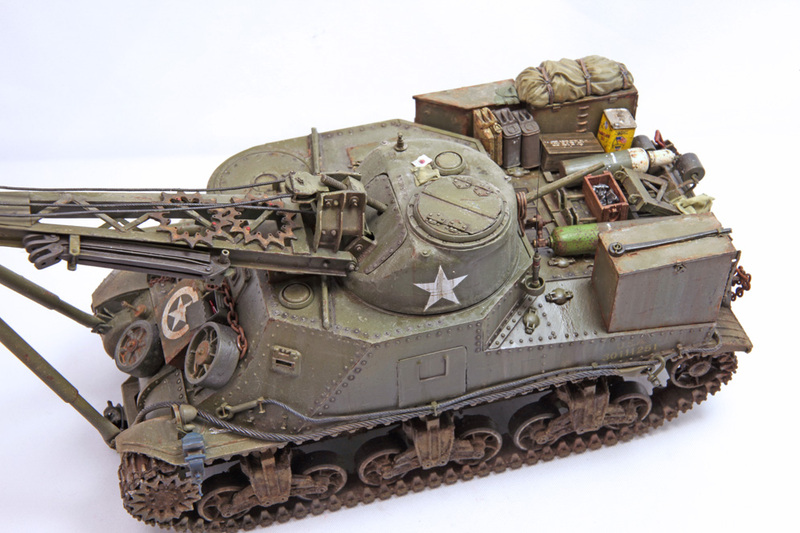 Here’s another great build from Martin and his project to build the M31ARV built from the Tamiya 1:35 scale kit. 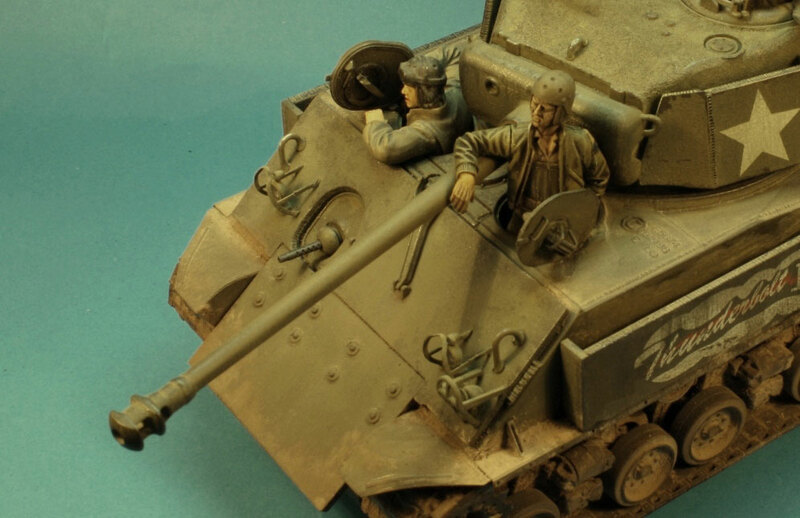 This model is the Hobby Boss 1:35 M35 Mittlere Panzerwagen (ADGZ-Daimler). The model was built (more or less) from the box. The kit provides ten vinyl tyres. I find that the problem with vinyl is that it does not take paint well and it can sometimes flake off. Here I used Alclad’s Black Primer as a base coat which seems to have stayed where I put it – for now. There are two options for painting. One is overall early-war dark grey and the other is the same colour with a camouflage pattern of red / brown. I chose the former scheme. Tamiya Nato Black (XF69) was used as a base coat with patchy over-sprays of progressively lighter greys on top of this. I started with Dark Sea Grey (XF54) adding a little dark blue and ending with Medium Sea Grey (XF83). I did not use the kit transfers, replacing them with some old dry-rub transfers to avoid having to apply a gloss varnish. The weathering was limited to a little chipping using Vallejo German Camouflage Black Brown applied with a piece of torn sponge. Some dust was applied using pastels from the Pan Pastels range augmented with some light over-sprays of Flat Earth (XF52) and Buff (XF55) on the lower half of the model. The model was painted using Xtracolor Olive drab as an overall coat, with Faded Olive Drab and faded olive drab faded a bit more, applied in a random pattern. When the wash was dry the model was sprayed overall with Humbrol Matt Cote. The M-36 was developed to replace the M-10 tank destroyer which was becoming obsolete as its 3-inch gun had difficulty engaging Panthers and Tigers. The new turret with its 90mm gun was mounted on the M-10 chassis and designated Motor Gun Carriage M36. These tank destroyers took part in the Battle of the Bulge during the winter of 1945. 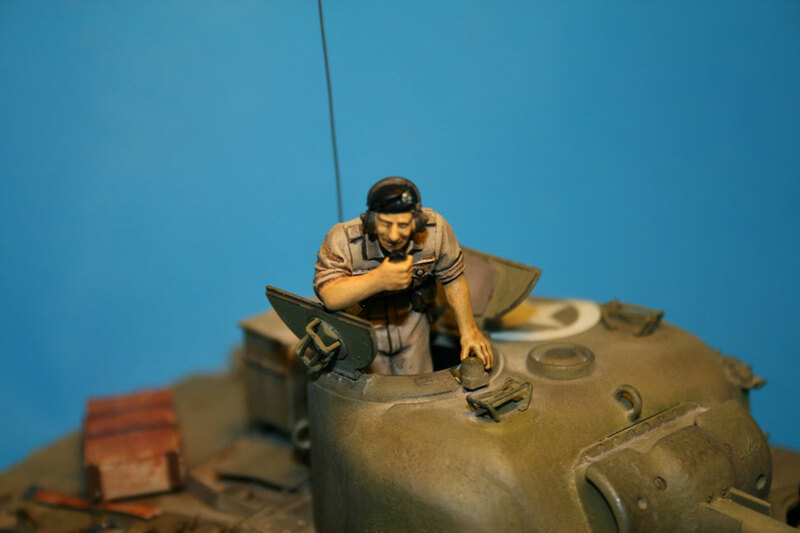 This is Dragon’s old British Composite Sherman M4A2 in 1:35 scale. Formations tool set and resin figures, the extra tracks and spare wheel from the spares box; decals from Bison, very nice, very thin! I also assembled and painted the commander figure using Humbrol matt enamel paints. 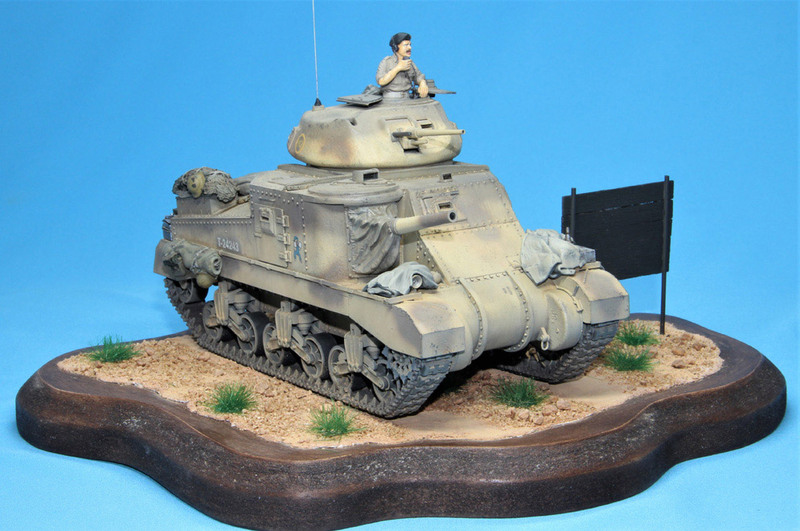 Here’s my Dragon 1:35 M4A3E8 – hope you like it. It’s finished in much the same way as other entries you’ll find in the SMN Subscribers’ Gallery. Here are a few more from my Sherman collection – this is the DML easy 8 M4A4 Sherman, sometimes called the ultimate Sherman as it had the big gun and add-on armour and the new VVSS suspension units. The crew were made from various bits from the spares box and the stowage is homemade from the spares box too. I bought this kit on impulse (a birthday treat for me!) and because I wanted to do a straightforward build out of the box, without having to bother with kit corrections and improvements. Which, as I recall, is what I did and was very satisfied with the build process? Aftermarket products are limited to MV lenses for the headlights and some of the accoutrements loaded on the engine deck. The figures are the old Dragon US Tankers, two having Hornet heads as I recall. The air recognition panel is wine bottle lead foil with Model Master Enamel # 1775, Fluorescent Red. Kit tracks were used as were kit decals for the markings with the exception of the stars for which a metal stencil was used. Finishing and weathering followed the method outlined by Steve Zaloga in his Osprey publication “Modeling US Armor of World War 2”. I heartily endorse the method; it is not complex, relatively quick and results in a very presentable model. Here’s some pictures of my latest completed armor model. The model is DML’s M4 Composite Hull PTO in 1:35th scale. The kit comes with both the high and low Bustle turrets. I wanted to do a low Bustle version. The kit version has both the loaders hatch, the pistol port, and the smoke discharge tube. None of which are on the version that I wanted to model. The conversion was fairly straightforward and rather simple. I sanded off all the detail on the loader’s hatch, and then glued it in place. The pistol port required cutting the raised wielded fairly to the turret away, then gluing the pistol hatch closed. I plugged the smoke port with sprue cut down to fit. All three areas were puttied with Squadron White putty, and then sanded smooth. To duplicate the cast surface I applied Tamiya Gray primer with the end of a wide stiff brush using plenty of primer. You can see the results in the one close up. I painted the M4 with Tamiya gray primer, then a mix of Tamiya FX-62 Olive Drab and Tamiya FX-60 Dark Yellow. I have two different shades of this mix for color modulation and shading. Weathering was done with Dark Earth AK Interactive Wash, and various homemade filters. Then a final wash of Tamiya XF-57 buff for an overall dusty effect that also helped to blend in all the various shades.